Finding my way in navigation! Not a good start to the day as far as flying goes; I normally book my lessons for 14:00 and was about to leave home at around 12:50 when I got a call from Mike. I assumed he must need to move my lesson for some reason, however on answering the call Mike ask if everything was OK, to which I replied “yes everything is fine, I’m just leaving now, I will be with you before 14:00”, the reply was, “I have you booked in for 12:00”. Sh*t, I thought and quickly checked my calendar, no I have it written down as 14:00, then I checked the on-line system and as normal Mike is right and I’m wrong. Luckily for me Mike and AAA Microlights are very accommodating and by moving a few people around a little he found time to squeeze me in. Thanks Mike and apologies to all impacted. Today’s lesson the first following my solo was navigation, I pulled out my map which had a route plotted on it from some time ago and Mike thought it was a good route to fly, but we were going to fly it in the opposite direction. Mike had me add the headings and 5nm lines on each leg counting back from each waypoint. 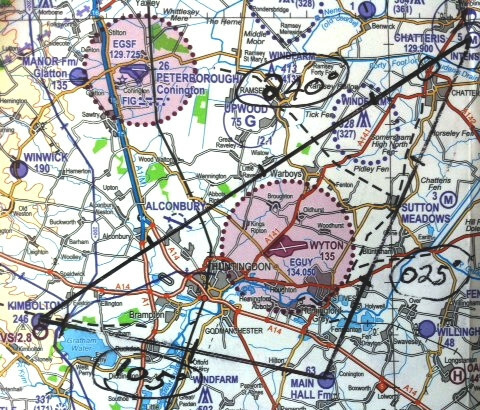 I then added a wind arrow to the map and for this flight as the wind was light we made an approximation for the headings and time to fly each leg. I had checked the aeroplane beforehand so we were ready to go, after starting up the parachute aeroplane called “Clear Drop” with gives around 5 mins before the first parachutists will be on the ground. Our engine was not even up to temperature for the power check, so we taxied away from the club house and waited for the engine to warm up and the parachutists to all come down. A while later we got the radio call “All Canopies Down” so we made our way over to Runway 06, not one I have used much, in fact I think this was only the second time. Up we went and made a climbing turn to the right on to crosswind leg and then another on to downwind, just as if we were going to do a circuit, but we continued to climb until we reached a chosen height of 3,000ft. I spotted our first point on the map, a roundabout not far from the airfield so from here we changed direction to a heading of 230° towards our waypoint of Kimbolton and noted the time. At around the halfway point Mike asked what could I see and I saw an airport to my left which was Wyton and, after a little prompting, another airport to my right which was Peterborough, ahead was a third airport Alconbury which we flew over; this was re assuring as it meant I was on track. Next was the A1M, A14, A1 junction to my right and in the distance was Grafham Water, about 2nm to the right would be our turning point, Kimbolton Airfield. It appears that spotting little airfields from 3,000ft needs a little practice! I finally spotted it and we turned on to the next leg with a heading of 120° and a new waypoint of Main Hall. As we flew this short leg I called out the things I could see and tried to relate them to the map. As we approached Main Hall, going by the time flown, Mike asked if I could see it and I could not, we must have been over it and Mike suggested we orbit while I look for it, but even with Mike telling me where it was I could not see it! A needle in a haystack comes to mind. 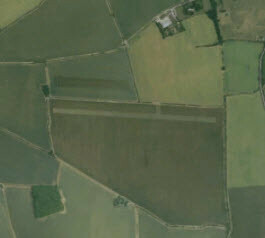 Then all of a sudden I can make out the grass strip from the surrounding grass fields! Note to self; on any solo navigations pick something easier to see and check it out on Google earth first! Form here we turned on to 030° to get back to Chatteris. All the time on each leg I had to make corrections to both height and direction and every time I looked for a land mark I changed one or the other! My first big error would have been, if Mike was not next to me, a simple one of misreading the compass, I was little disorientated from orbiting, else it would have been a simple turn to the left (it’s the only excuse I have! ), but I knew I needed to set a heading of 030° so as the compass clearly has 30 marked on it, no problem, Mike asks do I really want 30? I look at the map and saw it said 25 so I said, no 25, then Mike pointed out my school boy error 30 and 25 on the compass are 300° and 250° I wanted 3 on the compass 30°. Now with the correct heading we flew back to Chatteris and on the way we done some more landmark spotting and again it took me a long time to find one, Sutton Meadows airfield, which Mike pointed out so easily. I guess or at least I hope the more you fly the easier it gets to spot these things, as I did spot Chatteris airfield OK. Here stated yet more issues for me and I guess one of the main points of the lesson which was correctly joining the circuit. So we were now flying at 3,000ft on a heading of 060° and needed to descend and turn to join the circuit on Base leg which we did, however before this I got confused and found myself thinking if we took off on 06 we need to land in the opposite direction i.e. 24! I know this is wrong, but in my confused state it made sense to me! Mike needless to say corrected me and we joined left base for 06. 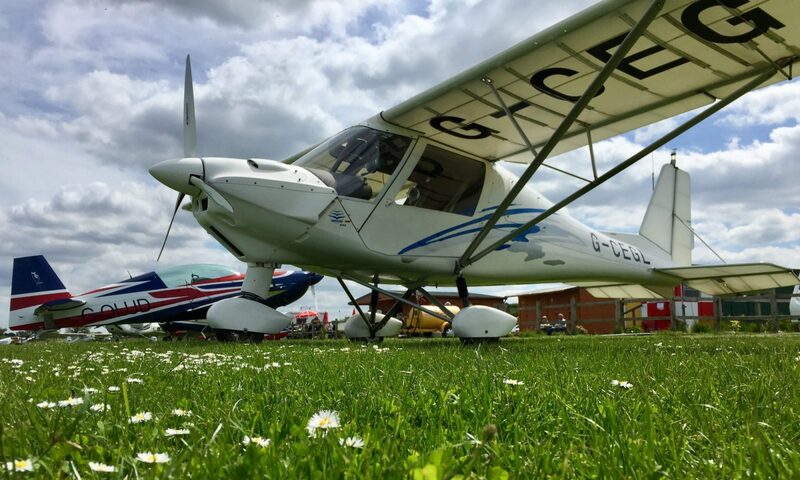 With little or no wind the approach was faster and I rounded out and then stopped the round out and bounced, I put power on and went around the next time I was more composed and made an OK landing and taxied back to the club house for a much needed cup of tea. As I was last to use the aeroplane and now have a share in it I needed to wash it before putting it away. Just before washing it Frank was coming back in his Flexwing which provided me with something to take pictures of for this post! I really enjoy my first navigation exercise, but it has also served to remind me just how much more I need to learn and how much more practice is needed before it becomes second nature. Next PostNext I’m leaving the circuit!